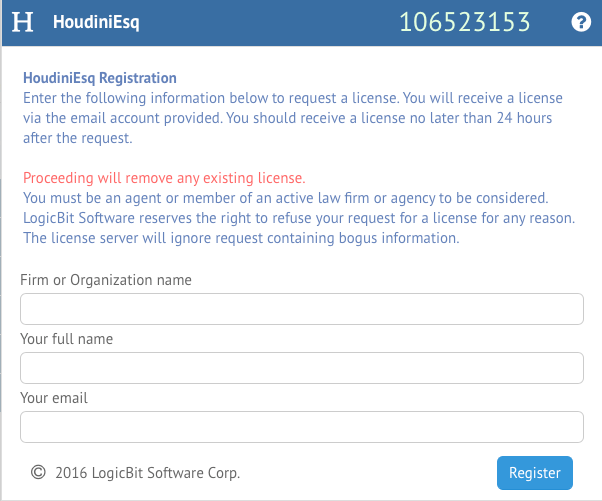 You can force HoudiniEsq to allow a single login so that the product may be re-registered by simply dropping a file named houdini.rereg into a folder. Step 1: Stop the HoudiniEsq service. Step 2: Navigate to the following folder: HoudiniESQ/webapps/houdini/esb/config/keystores on your C: drive under Program Files (or if you are on a Mac go to Macintosh HD/Applications). If you are on a 64-bit operating system, this also may be under Program Files (x86). Step 3: Copy the file named houdini.jkey and paste the file in the same location (DO NOT DELETE THE ORIGINAL houdini.jkey FILE). Rename the copy to houdini.rereg. Make sure the File Extension is changed, we want houdini.rereg, NOT houdini.rereg.jkey. If you see the following message click ok. Step 4: Start the HoudiniEsq service. Step 5: Log into the program and you should see a screen like this. Note, if the words ‘Invalid License‘ are flashing that’s ok, keep going. Step 6: Fill out the fields of information and click Send. If you are locked out and need the license ASAP to get access to your data again email us at support@houdiniesq.com and/or call 1.888.366.2280 so we can get you back into the system. Note: Old License files will not work, you cannot get an old license from your email history and paste that in, it will not work.